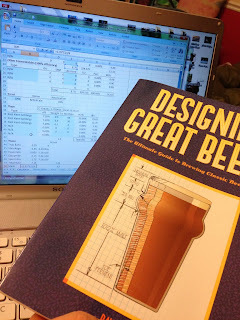 Ray Daniels call them the "Six Steps To Successful Beer" in his book Designing Great Beers. In following with the analogy of brewing as similar to creating music, I'll call them the 6 strings of the guitar. Oh, clever, huh? First of all, this book is a great resource and if the instructions are followed, you truly will be able to design your own great beers. It's similar to baking a pie from scratch. With some knowledge and the proper ingredients and process, it is as easy as... well, pie. Daniel's book first identifies these 6 steps and then systematically goes through the processes in determining which results you want and then how to obtain those results. It can get kinda heady at times. I'll simply point you to his book for the answers. For this post, it is enough to know those items you will need to know. What do you know about each? All are needed to brew beer. Daniels does a nice job of taking these items one at a time. Once all are understood, it's like a guitar that is fully tuned...ready for the next chord to be played.